I first came across the name Walter Rheiner in a publication about the Expressionist artist Conrad Felixmüller. Leafing through its pages, my eye was caught by a particularly striking painting dating from 1925, on which a young man, bespectacled and wearing a black suit, is depicted hovering over a row of potted geraniums placed on the ledge of an open window. Outside, the gables and roofs of a nocturnal city stretch as far as the horizon, glaringly punctuated by windows bleeding red, green and yellow light. 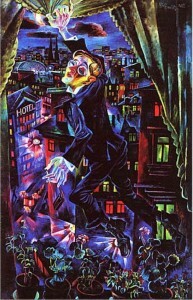 The image leaves it to the beholder to decide whether the figure, whose right hand still clutches the curtain while a used syringe dangles between the fingers of the other, is about to plunge to his death in the street below or on the verge of taking off into the skies headed for an unknown destination. 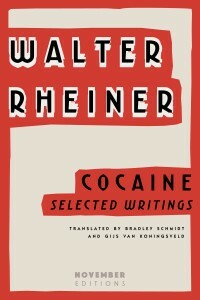 And yet its title leaves little doubt as to the answer: The Death of the Poet Walter Rheiner. The painting wouldn’t leave my mind for days. Who was this person, I kept wondering, this poet called Walter Rheiner? Had he really ended his life in the bizarre way Felixmüller would have us believe? The Internet offered only the most basic information, but one thing was quickly established: Rheiner was no figment of the painter’s imagination, he had really existed and he had really been a poet. Between the years 1917 and 1922, he had published several volumes of poetry as well as a novella called Kokain. Moreover, he had been friends not only with Felixmüller, but also with as host of other Expressionist artists and writers of repute (among whom Ludwig Meidner, Johannes R. Becher, Yvan Goll and Else Lasker-Schüler). But apparently his career had been cut off prematurely as the result of a morphine overdose at the age of 30; whether he had also jumped from a window remained an open question. I ordered the only publication of Rheiner’s work still in circulation, an annotated collection edited by Thomas Rietzschel for Reclam Verlag titled Kokain: Lyrik, Prosa, Briefe (1985). When it arrived, I was immediately struck by the strength and intensity of the writing. 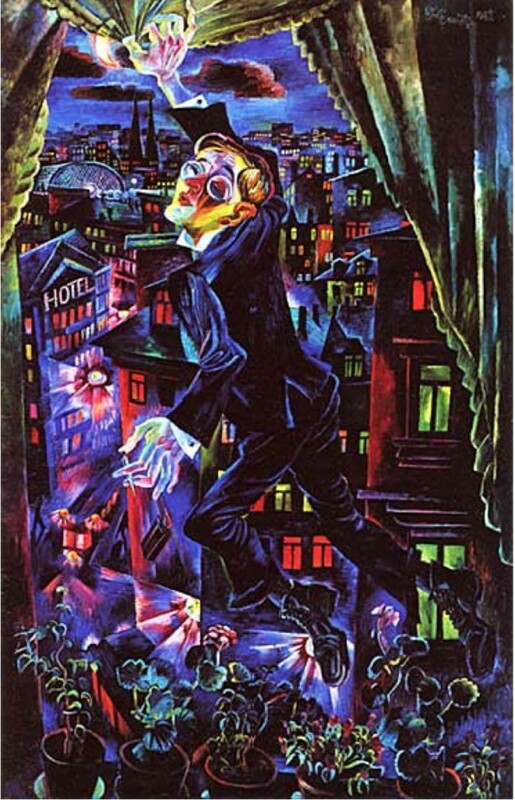 The novella Cocaine, written in a key of hallucinatory fever, provides a close-up of Berlin’s underbelly during the years of WWI, with the demise of its protagonist foreshadowing the author’s own tragic end. Both the poems and the shorter prose pieces evoke a shattered world traversed by characters plagued by solitude, madness and addiction, doomed lovers and delirious shell-shocked soldiers. In short, it baffled me why Rheiner’s work wasn’t more widely known and why none of it had ever been translated into English. Ultimately, in an effort to learn more about Rheiner I decided to take a trip to Berlin, where I hoped to find traces of his ghost by exploring the streets he had known and written about so arrestingly. To find out what my explorations yielded, you can listen to the report I made for Berlin’s American radio station NPR here. And go here for more information on the translation of Rheiner’s work put together by Bradley Schmidt and myself.